Born in Austrio-Hungary, Rudolph Laban was a dancer, choreographer and dance theoretician. A pioneer of European modern dance, his influence and legacy has been extended by famous pupils such as Mary Wigman, Kurt Joos and Sigurd Leeder. One of the original initiators of dance scholarship, he raised the status of dance as an artform by establishing the discipline of dance study (choreology). He also developed community dance which originally utilised mime techniques for dance in education. However, when Laban originally observed ritualised dance, it was the movement motivation that was his particular fascination. The original motives and objectives have since become obscured, somewhat edited (though not necessarily by deliberate misinterpretation). 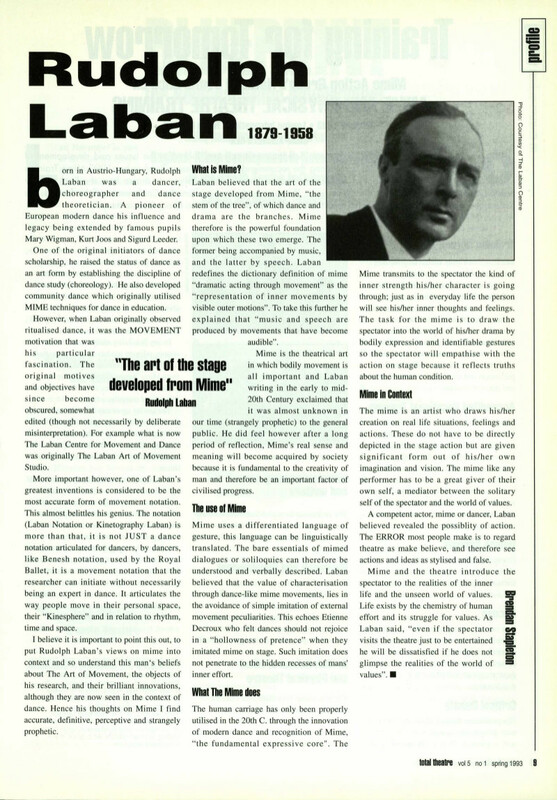 For example what is now The Laban Centre for Movement and Dance was originally The Laban Art of Movement Studio. The art of the stage developed from mime. More important, however, one of Laban’s greatest inventions is considered to be the most accurate form of movement notation. This almost belittles his genius. The notation (Laban Notation or Kinetography Laban) is more than that, it is not just a dance notation articulated for dancers, by dancers, like Benesh notation, used by the Royal Ballet; it is a movement notation that the researcher can initiate without necessarily being an expert in dance. It articulates the way people move in their personal space, their ‘Kinesphere’, and in relation to rhythm, time and space. I believe it is important to point this out, to put Rudolph Laban’s views on mime into context and so understand this man’s beliefs about The Art of Movement, the objects of his research, and their brilliant innovations, although they are now seen in the context of dance. Hence his thoughts on Mime I find accurate, definitive, perceptive and strangely prophetic. Laban believed that the art of the stage developed from Mime, the ‘stem of the tree’, of which dance and drama are the branches. Mime therefore is the powerful foundation upon which these two emerge. The former being accompanied by music, and the latter by speech. Laban redefines the dictionary definition of mime, ‘dramatic acting through movement’, as the ‘representation of inner movements by visible outer motions’. To take this further he explained that ‘music and speech are produced by movements that have become audible’. Mime is the theatrical art in which bodily movement is all-important and Laban writing in the early to mid 20th Century exclaimed that it was almost unknown in our time (strangely prophetic) to the general public. He did feel, however, after a long period of reflection, that Mime’s real sense and meaning will become acquired by society because it is fundamental to the creativity of man and therefore must be an important factor of civilised progress. Mime uses a differentiated language of gesture, this language can be linguistically translated. The bare essentials of mimed dialogues or soliloquies can therefore be understood and verbally described. Laban believed that the value of characterisation through dance-like mime movements lies in the avoidance of simple imitation of external movement peculiarities. This echoes Étienne Decroux who felt dances should not rejoice in a ‘hollowness of pretence’ when they imitated mime on stage. Such imitation does not penetrate to the hidden recesses of man’s inner effort. The human carriage has only been properly utilised in the 20th Century through the innovation of modern dance and recognition of Mime, the ‘fundamental expressive core’. The Mime transmits to the spectator the kind of inner strength his/her character is going through: just as in everyday life the person will see his/her inner thoughts and feelings. The task for the mime is to draw the spectator into the world of his/her drama by bodily expression and identifiable gestures so the spectator will empathise with the action on stage because it reflects truths about the human condition. The mime is an artist who draws his/her creation on real life situations, feelings and actions. These do not have to be directly depicted in the stage action but are given significant form out of his/her own imagination and vision. The mime like any performer has to be a great giver of their own self, a mediator between the solitary self of the spectator and the world of values. A competent actor, mime or dancer, Laban believed this revealed the possibility of action. The error most people make is to regard theatre as make believe, and therefore see actions and ideas as stylised and false. Mime and the theatre introduce the spectator to the realities of the inner life and the unseen world of values. Life exists by the chemistry of human effort and its struggle for values. As Laban said, ‘even if the spectator visits the theatre just to be entertained he will be dissatisfied if he does not glimpse the realities of the world of values’.